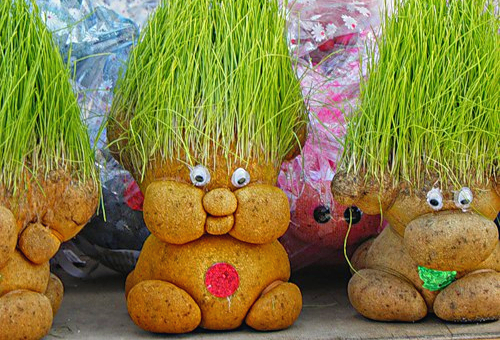 Travnik – this is a great souvenir for adults and children, which on top of rising thick hair from turf grass. To Travnik looked healthy and attractive, you need to prepare for him a warm, well-lit place and provide regular watering, spraying and mowing pet. Travnik (acouchi, ecologic or florrick) is a fun souvenir, made of PVC, sawdust, and seeds of lawn grasses. If you regularly water and fertilize travancic that the seeds of lawn grass will sprout, and this nice man or a funny animal appears lush green hair. Florrick will be a great decoration for children's room and a tasty treat for Pets. Before Travnik settle in a Sunny window in the nursery, you need to soak it in water to seeds under the textile sheath was saturated with moisture, swollen and ready for growth. For soaking souvenir fit any container filled with water at room temperature. Immerse the florrick in the water a little and hold with hand so it doesn't pop up to the surface and faster absorbent. Leave a souvenir in the water for 45 minutes. If the cold season, it is better to arrange for a pet mini-greenhouse. To do this, take a plastic bag, put on the bottom of the bowl with a damp souvenir and tie the top of the pack to the host. The finished greenhouse need to be put closer to the battery. If the seeds in Travancore fresh and viable, they will germinate within 1-2 days. As soon as in a textile shell seems first delicate shoots, the souvenir must be removed from the package and put it on the window. While Travnik basking in the greenhouse, you need to choose a suitable location. Ideally it should be a Sunny window sill, but on a bookshelf or a small table near the window pet will feel perfectly comfortable. The main thing – to close the tender shoots was not heat, otherwise the thin blades of grass wither very quickly. On a warm Sunny location Travnik will soon be covered with lush emerald grass. Travnik need to be watered every day, evenly distributing the moisture over its surface. Once a week you should bathe your pet, lowering it by 15-20 minutes in a container of water at room temperature. If the air in the room is dry, a souvenir have to be sprayed, protecting it from drying out. Children love to cut Travnikov and make them all sorts of hairstyles. To cut the pet can be 10-14 days after the first germination, by this time the grass reached a height of 8-10 cm If the hair is not managed or is too short – don't worry, because green hair would grow back in 2-3 weeks. Shelf life of unused Travnikov is 2 years, so much turf grass seeds remain viable. After two years, some seeds may be lost, and the hair of your pet will be not as thick and lush as I'd like. Therefore, when buying a florrick should study carefully the date of its release and set the retention period. If you forgot to water your pet, and thin blades of grass wilted, or dried up, put it down for a while in a container of water at room temperature. This procedure acts on the florrick oilsuse. If the grass has dried completely, you can either throw away a souvenir or rip the textile base and fill it with fresh seeds.